There is something about spring that puts me in the fashion mode (Jack at shipslog doesn't understand. ha). Though I don't really buy much, I do a lot of window shopping. I don't need any new clothes. I'm fine with the new smaller clothes I was able to purchase last year. I usually will get a new outfit to wear Easter Sunday but a thrift store purchase works just fine for that. 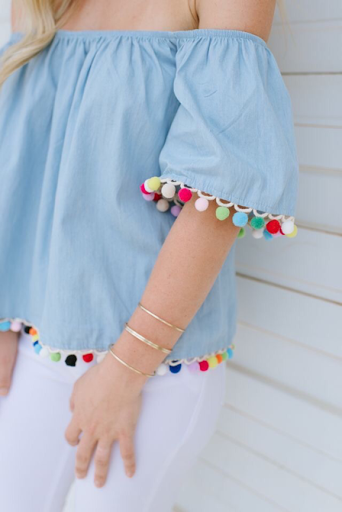 I noticed in the stores lately, a lot of things with pom pom trim. At first I thought "too hippie or bohemian for me", but then it grew on me and I absolutely adore it! 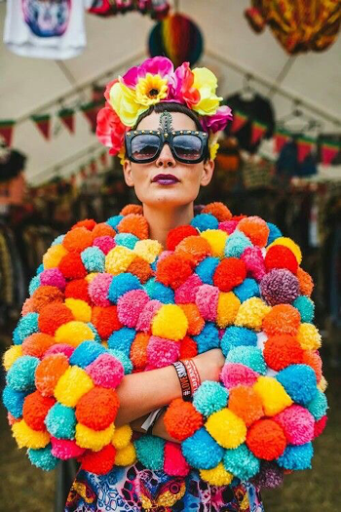 I'm now on a mission to either buy or make my own pom pom fashion. That's going over board but a little trim and dazzle is perfect for summer time at the beach. They are putting pom poms on everything now. I love all these looks and more that I found online. I hope Mom reads this because I bet she can trim out anything I want if I decide to go that route. I went to the Goodwill last night. No intentions of buying shorts but I found these distressed name brand shorts that fit me perfect! 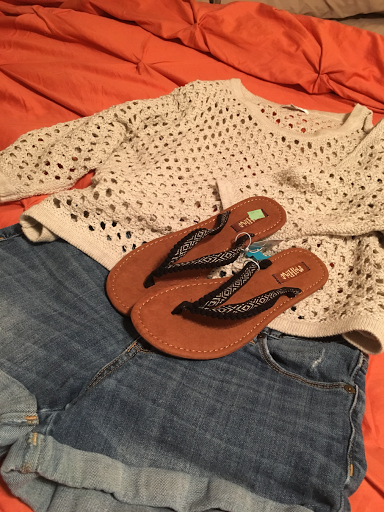 I also found a light weight sweater to throw on over a bikini top and ....yes brand new, with tags, flip flops with tiny black pom poms on them. I may even add some colored one to them. After all, they only costed me 3.00. This will be perfect to wear at the beach on a cool summer evening walk or play. I'm taking a trip to the dollar store today to purchase my own pom poms. I have a hat like this that needs some color! 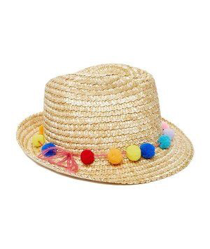 Ok maybe I'm a little "boho"
I think I would look dazzling in that last hat. I am antipompom, but the Goodwill outfit you bought looks like perfect summer wear. I especially like the sweater. 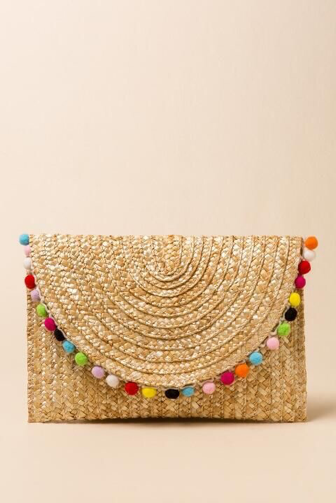 I absolutely love that clutch - where did you find that???? Pinterst! Hahaha. Maybe I need to add links. I like it too!!!! Sure adds a nice bit of color. I bet she looks lovely carrying it! "Everything old is new again." Seems to me this was a fashion in the late 60's. 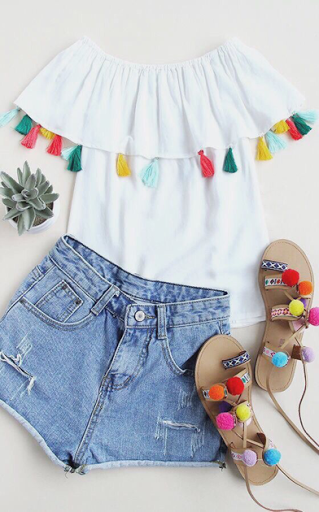 Love the clutch purse with pompoms. And your outfit was cute.